286 pages | 21 B/W Illus. In November 2008, John Hattie’s ground-breaking book Visible Learning synthesised the results of more than fifteen years research involving millions of students and represented the biggest ever collection of evidence-based research into what actually works in schools to improve learning. Visible Learning for Teachers takes the next step and brings those ground breaking concepts to a completely new audience. Written for students, pre-service and in-service teachers, it explains how to apply the principles of Visible Learning to any classroom anywhere in the world. The author offers concise and user-friendly summaries of the most successful interventions and offers practical step-by-step guidance to the successful implementation of visible learning and visible teaching in the classroom. "Visible Learning for Teachers is a profoundly important book for teachers, school leaders, parents, and policymakers. John Hattie provides the 'jury standard' for educational research. Rather than the typical 'he said, she said' controversy, Hattie has amassed the preponderance of the evidence representing the work of thousands of scholars and more than a quarter-billion children. The jury – teachers, leaders, and parents – need not be swayed by the persuasive power of an individual researcher or the flavor-of-the-month initiative. Rather, we can at last make teaching and leadership decisions based upon the best available evidence from multiple sources. As you read these pages, prepare to be challenged. Hattie forced me to reconsider previously strongly held convictions, but he requires that we elevate the preponderance of the evidence over personal belief. Best of all, Hattie shows us how to determine the impact we have right now with our own students. His methods move education from the 'rear-view mirror' – what happened in other places with other students – to the 'windshield' – what is happening right now with our students. As a result, this book is the most important contribution to educational research and practice in decades." "This scope of this text is absolutely staggering. John Hattie deserves to be recognised (and probably will in time) as one of the pioneers of educational and school psychology." Why not download our Routledge FreeBook Know Thy Impact: Visible Learning in Theory and Practice? 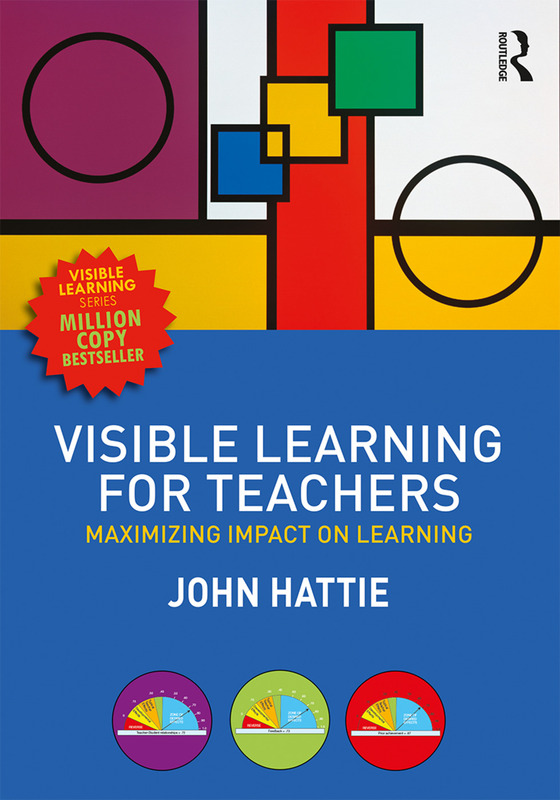 This resource comprises a carefully curated selection of chapters from John Hattie’s groundbreaking work in education and classroom practice, including a chapter from Visible Learning for Teachers.